I’ve talked about our friends, Janet and Lalo before. I like to refer to them as a couple of posers, angels trying to pass as humans. They are simple people who love the earth and its inhabitants, are not extravagant, just kind caring people who do some pretty damn nice things for others … often. Lalo has been creating mosaics for years. Lalo spent his life teaching, and one of his early mosaics was for the school district he was teaching at in Fresno. They still proudly display it today. Over the years he has created more mosaics than he can probably count, for friends and loved ones. In the last few years, Lalo was able to retire. One might ask, what does a retired angel do with his time? Well, the answer is, he does more mosaics, of course. But what I love is that he’s branched out. A few years back he started creating amazingly beautiful mosaics for wineries, without being asked, or paid. 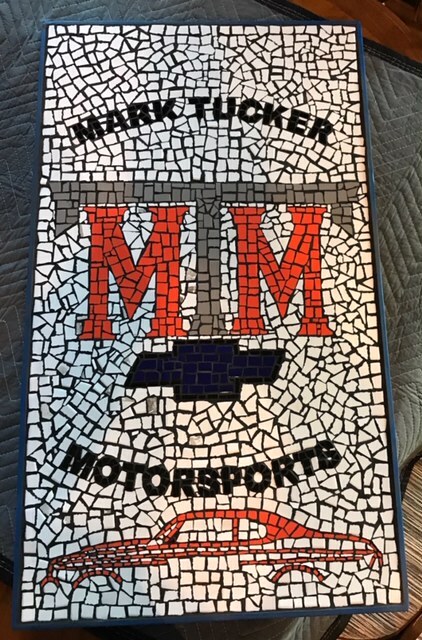 If Janet and Lalo enjoyed visiting a winery over time, he would just show up one day with this mosaic masterpiece that seriously, if the winery were to commission an artist to create anything even remotely as nice, would be extremely costly. Instead of anyone asking or even understanding what he does, Lalo just moseys into the winery in his unassuming way, presenting the owner with his magnificent creation. Really? How many people would do that? When we heard about one of his first ones, we came along for the unveiling. I kept thinking to myself … if I was the owner of this winery, I would be blown away. Lucky day … jackpot. That day, I decided that I wanted to do my part to create a buzz. I want his work to be known as “A Lalo Sanchez,” but preferably before the artist dies. I’ve been joking with him since, and told him one day I would post about him. Of course, the mere mention makes him shake his head and look away with a giggle … you know those angels, they won’t take much credit. I have been waiting for the right story, and last weekend my mind finally began the process of putting together this post. Once again we were graced with a visit from Janet and Lalo. Since it was so cold out (this angel doesn’t like the cold) we decided to do more inside work than outside, so Lalo brought along his current mosaic project, a surprise for an old friend who likes to race. We set up camp on our kitchen table, each of us taking a side to work on, and for the better part of two days we worked to complete the mosaic. It’s been a long time since I did a craft. I sewed and stitched and quilted for years and always found the process of creating enormously enjoyable and therapeutic. These days my artwork happens in my garden and on my computer, and I equally love that, but there’s something about creating a work of art with your hands, something that takes shape as you continue to painstakingly work at it, right before your eyes … just the thought of it makes me breathe deep and shake my head. It’s so satisfying and I think just damn good for your soul. What I found interesting as the weekend progressed, was the number of minutes that would pass between anyone needing to speak. Four people sitting intimately around a small wooden table not uttering a word for 20 minutes at a time, that’s interesting to me. Studies have found that when humans sing or chant together, their heartbeats synchronize. Think about that … to me, it’s just such a confirmation that we are all so connected in more ways than we will ever know, and that we communicate not only through our words, but maybe even more so through our bodies, our energies and our minds. I was contemplating that when we sat so quietly piecing tiles together, wondering if our combined energy was hovering somewhere just over our heads, uniting in the magnificence that can only be described as love, creating not only something of beauty, but something that would continue into the world bringing perhaps a harmony or a positive energy. And at that moment, I understood just how important Lalo’s work is, all of those numerous Lalo Sanchez’s that are starting to add up around the state. To date, the lucky wineries include Tobin James in Paso Robles, Bodega de Edgar in Paso Robles, Klinker Brick in Lodi, Idle Hour in Oakhurst, and Ziveli in Fresno. One of his latest major projects was for the Fresno Fire Department. They used the mosaic to help solicit donations. And his newest project, he will be working on something for the Shriners in the hopes that it can raise funds for such a great charitable organization. I hope to get my hands back on some tiles again soon, but in the meantime I will be just as thankful when my fingers find themselves on my keyboard. If you happen to be at any of the above wineries, you might want to ask to see their Lalo Sanchez, and make sure to emphasize his name if you think of it.